Thank-you so much if you have supported me in my fundraising efforts! Starting at the Chelmsford Marathon in October 2014, I challenged myself to run 24 marathons and ultra marathons in 12 months, to raise money for the Saint Francis Hospice who made such a difference to our family when my father-in-law passed away. I raised £2571.25 (inc. gift aid) to say "thank-you". My events were comprised of 13 marathons, and 11 ultras, including the Thames Path 100 mile run, and three weeks later, the 145 mile Grand Union Canal Race from Birmingham to London. My wonderful father-in-law, Roger, passed away on 15th October 2014, just two months after falling ill, and just a month after receiving a cancer diagnosis. It's been an incredibly difficult and painful time, but the support of the Saint Francis Hospice was invaluable to us, and made it possible for Roger to stay at home until the end. I wanted to help the Hospice continue to do such brilliant work for other families, and they were also a charity that Roger donated to before he was ill, so it seemed fitting that I supported them in his memory. In May 2014, I took part in the Thames Path 100 event, and raised £1,954.44 (inc. gift aid) for Centrepoint, the UK's leading charity for homeless young people. The Thames Path 100 is a 100 mile non stop foot race which saw me finding my way, cross country, between London and Oxford, and I completed the event in 22 hours and 20 minutes. Running (and walking) non-stop through the night until I got to the finish, this was the hardest and most painful thing I have ever done but it was an incredible experience. The main reason that I chose Centrepoint is that back in the day when I had a much more chaotic life than I do now, and made very bad choices, had it not been for the support of my family, I could have very easily ended up homeless and I have always been aware of just how close I got and how incredibly lucky I am that they were there for me to bail me out with the rent money again, or to take me back home when it all went wrong. I understand only too well how life can turn upside down, even for someone like me - I was a loved and lucky teenager with a world of support and opportunity. I can't imagine how difficult life can be for children who come from less fortunate backgrounds, or from abusive homes, or how they manage when they end up alone in the terrifying position of having to survive on the streets. In May 2013 I took part in the Brathay 10in10 event which saw me running an insane ten marathons around Lake Windermere in the Lake District, on ten consecutive days, and raised £5,029 (inc. gift aid) for Brathay Trust, a wonderful charity that helps disadvantaged and vulnerable children across the UK. It was a truly incredible event, that without a doubt was life changing for me, and Brathay is an organisation that will now always be close to my heart. 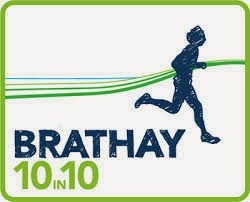 As a group, the 15 of us who took part in the 10in10, raised the staggering amount of nearly £85,000 and I know that Brathay will do wonderful things with that money and really change other people's lives too. All of the donations we received from our supporters went directly to Brathay - we all paid the £800 that it cost per person to stage the event. "Our aim is to become a leading charity that inspires children and young people to engage positively in their communities. We recognise that children and young people face many challenges in their day-to-day lives, and we work with some of the most vulnerable, disengaged and ‘hard-to-reach’, helping them to develop the confidence, motivation, and skills they need to unlock their potential and make positive changes in their lives. We deliver integrated community and residential programmes that help young people to re-engage with education, have a voice in their community, become peer mentors and young leaders, and avoid or move away from criminal activity." In October '10 I ran the Royal Parks Half Marathon and raised £1,182 (inc. gift aid) for a charity called Elephant Family. It gets more awkward asking for money for running marathons the more often you do them, so I didn't push this too much and relied on a few family & friends who I knew particularly wanted to sponsor me, and a few very generous corporate sponsors who I managed to convince that sponsoring me was a good idea! I was very pleased that I managed to raise £1,000 for the charity, who work to save the Asian Elephant from extinction in the wild - I went on holiday to India and fell in love with the elephants, but it's likely that they will be no longer be found in the wild in just 30 years! Since Elephant Family's launch in 2002 they've invested £3 million in securing and restoring vital corridors of land, supported local communities to reduce incidents of human-elephant conflict and improved the welfare of captive elephants. In 2010, I ran the London Marathon with a gold bond place from The RNLI, and raised just over £2,284 (inc. gift aid). The RNLI are very well known in the UK and are considered the "fourth emergency service" by many, providing lifeboat rescue services for those who get into trouble in the sea around the coast and also on rivers, flood assistance and they also provide beach lifeguards. What people don't always realise is that they receive no funding from the government, are made up of ranks of many volunteers, and rely entirely on charitable donations. In 2008, I ran the London Marathon with the charity Cardiac Risk in the Young, and raised £2,495 (inc. gift aid), in memory of my wonderful dad who devastatingly died suddenly of a heart attack, when I was 19. CRY work to raise awareness of conditions that can lead to Sudden Death Syndrome and also promote screening programmes and research into cardiac issues, particularly for young people and those involved in sport, for whom problems can often go undetected, which could been treated.